I ran a 5k! Well, walked and ran, but you get the gist. A couple months ago some of my friends stumbled upon this amazing 5k called The Color Run and we agreed to run it together. You may remember from this post that I took up running earlier this year, so I figured I could complete the 5k no problem. Well, life happened and I got off track with my running. Instead I picked back up on rebounding to get in my exercise. I figured I'd be keeping my legs strong so I'd be good for the 5k. While running it I felt pretty great and finished at a time I was shooting for (about 40 minutes - it wasn't timed, so I don't know exactly), but the next morning the muscle aches set in! I am still pretty sore, especially first thing in the morning. I feel like an old lady! I guess I can't be a weekend warrior after all. But even with the pain, it was so worth it. We started off the race nice and clean with bright white shirts. Along the path of the 5k, there are different checkpoints where runners get pelted with powdered color (non-toxic corn starch based dyes). After crossing the finish line, you come out looking something like this. 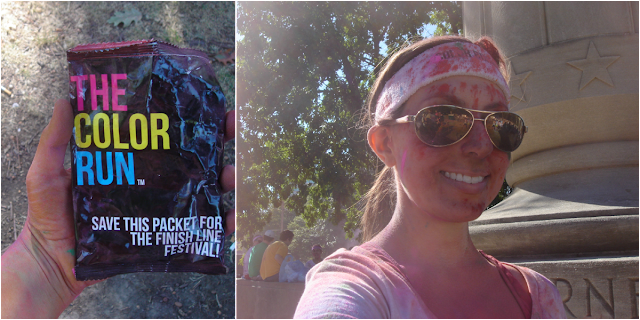 I didn't get too covered in color while running the 5k, but the after party was another story. Everyone gathers past the finish line and on the count of ten throws a packet of color up in the air. It was complete and utter chaos! And this time, I got COVERED in color. It was such a cool experience and I'm so glad I did it. The Color Run is a great way to break into 5ks because it is such a laid back and fun event. It's not timed, so there's really no pressure. Many people walk the whole way and there's no urge to jockey for position and get ahead of the pack. It's more about enjoying the scenery and the morning with about 15,000 fellow runners. Oh, and coming out as colorful as possible of course! Love it! I love the pic of your finish, you look so excited! I was excited! I was looking for Heather and when I finally found her she was snapping a photo so I laughed and this is how it turned out. Well done! I looked into it after being inspired by this post, but the closest one to us happened July 29th. What a great idea! Thanks! There are a couple of other similar 5ks, one is called The Graffiti Run. You may be able to find one in your area!